Luther Muhammad, receiving the first start of his collegiate career in the exhibition game against UNC Pembroke on Thursday, is in the middle of a learning process. He said he’s learning the offense, learning how to be a great teammate and how to come in and work every day. But that wasn’t the first thing he mentioned. 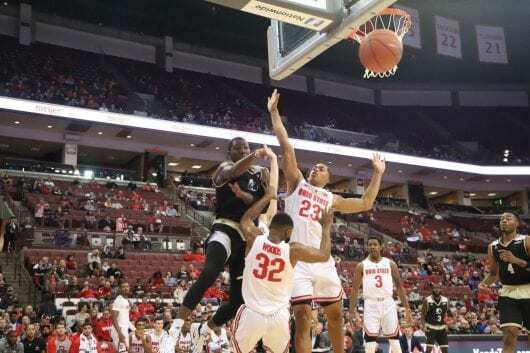 As the Ohio State men’s basketball team prepares for its season, defeating the Braves 81-61 in the final exhibition before the season starts against Cincinnati on Wednesday, defense has been one of the main priorities for second-year head coach Chris Holtmann. For Holtmann, it’s more about what he does not have that he did have last season. Ohio State showed its aggressiveness defensively immediately after tip-off. With a starting lineup of Muhammad, senior guard C.J. Jackson, junior forward Andre Wesson, sophomore forward Kyle Young and sophomore forward Kaleb Wesson, what Holtmann considers his top defensive lineup, the Buckeyes forced UNC Pembroke to a shot-clock violation, a strip and a travel on the first three defensive possessions of the game. Ohio State allowed the Braves to shoot 32.8 percent from the field, out-rebounding the team 56 to 35, including 21 offensive rebounds, showing an aggressiveness in the post by Kaleb Wesson and junior center Micah Potter. Muhammad said starting the game with sound defense sets the tone for the rest of the game, setting the expectation for the Buckeyes. While Holtmann said his team cared about its performance defensively, highlighting the effort of Jackson specifically postgame, he said his team was especially careless with the ball on Thursday night. The Buckeyes recorded 21 turnovers in Thursday’s 18-point win over the Braves, with sophomore guard Musa Jallow recording five turnovers and Andre Wesson recording four. When asked if this had been a problem in practice, Holtmann did not hold back, saying there are certain players that struggle with turnovers more than others. Freshman guard Duane Washington Jr. said ball security is something his head coach is very passionate about, especially with the guards on the rosters. He said Holtmann tallies up the turnovers made in practice and forces them to run depending on the total. But, for Washington, this just shows the importance of ball security, especially with Ohio State’s past. Statistically, the Buckeyes also struggled with scoring from deep, making five of 25 attempts from three-point range. Washington and freshman forward Justin Ahrens combined to make just two three pointers in 10 attempts. Holtmann said he is not as worried about this aspect of Ohio State’s offense, citing “jitters” and not giving players extended and consistent minutes as reasons behind the struggles. However, that does not take away Holtmann’s urgency for improvement. Especially with the schedule that is coming up for the Buckeyes, opening the season on the road against CIncinnati, his team has work to do.